Coimbatore : The leaders of constituents of DMK-Led Secular Progressive Front Monday met and discussed to chalk out the strategy to work for the victory of the Front candidate P R Natarajan of CPIM from Coimbatore Lok Sabha constituency. The meeting also discussed the visit of DMK president, M K Stalin on April three to campaign in the constituency, senior party leader and former minister, Pongalur N Palanisamy said. Talking to reporters, Palanisamy said that strategy will be worked out to defeat the AIADMK candidates and also to oust its government from the State and BJP-led governnment at the Centre. 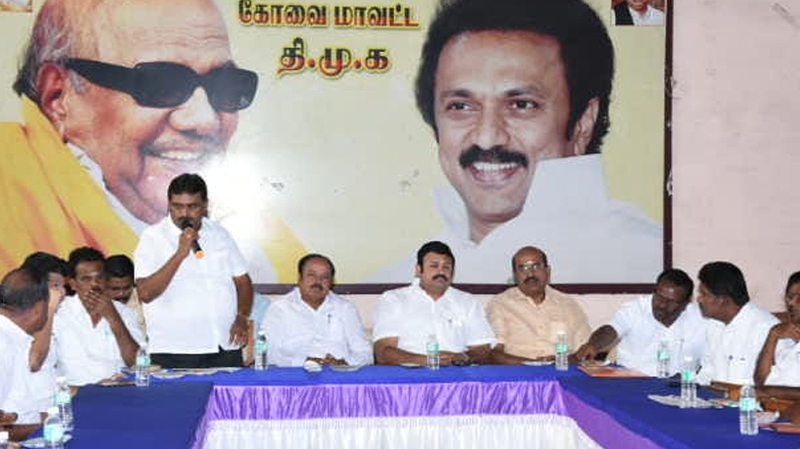 Stating that the DMK-led front was a natural alliance, he said that AIADMK alliance was an opportunistic one and BJP can only contest the elections, and not not win from Coimbatore. The meeing was presided over by DMK Urban District secretary and MLA, N Kathik, and Congress leader Jayakumar, CPI former MLA, M Arumugham, IUML secretary Mohamed Basheer, Ilakkiyan of VCK, R R Mohankumar of MDMK, V S Sundaram of CPI and CPIM secretary V Ramamurthy were present.